Techfloyd: How To Set Gmail as your Default email Client in Firefox. Techfloyd: How To Set Gmail as your Default email Client in Firefox. Firefox emerged as fastest and more secure web browser in the world , those who are using it can experience it's power like me but still Internet Exprorer is the most popular web browser in he world, near about 1/3 internet users in the world still use Internet Explorer, for those of you using newly released Firefox , or willing to give it a try click Here . you can take advantage of a new features that lets you set Gmail as the default for all email links -- those that contain " Mailto" in them. Suppose you want to contact anybody on web and do not have a default email client setup, then clicking those links typically launches an installation wizard for a desktop mail client , or open some email software that you don't actually use , Firefox have it's solution , you can configure Firefox to launch Gmail when you click on email address links and avoid the hassale. Follow the following steps to do this. 1.Log on to www.gmail.com and sign in. 2.copy and paste following code into your browser address bar and press enter. But for Google Apps user this code is something different which is given below , but is given code be sure to replace yourdomain.com with your Google Apps domain name . 3.For Gmail user click add application . you just added Gmail to your browsers list of mail clients. 4. You can set Gmail as default email client . 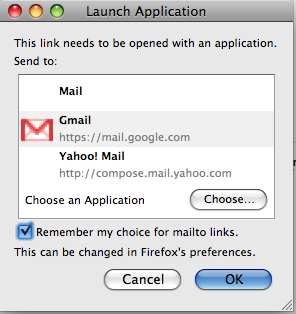 you will get a dialog box with list of available email application by selecting Gmail and checking " emember my choicefor mailto links" after doing this setting by going into Tool===>>Option===>Application ===>"Mailto" option.there is a drop down next to the option that lets you change your default. Clicking " Application Detail" will take you to a setting page where you can completely remove Gmail or other e-mail apps .